Created in 1932 par M. Gérard Parizeau, the journal Assurances et Gestion des Risques is one of the oldest Canadian publications in insurance. The journal Assurances initially consisted in a four-page document distributed monthly to insurance professionals in the Province of Quebec. Following its acquisition by HEC Montreal in 1996, the journal started accepting refereed academic papers and its name was changed to Assurances et Gestion des Risques. In 2014, the activities of the journal were transferred to the Faculty of Business Administration at Université Laval. This journal is part of a select group of publications in the domain of insurance and risk management, offering the possibility to transfer academics as well as practitioners’ research output. The world of risk management is constantly evolving and is becoming more important in the academic community. This tendency hinges on a greater need for risk management programmes by firms and on the perpetually changing world of insurance. At the era of communications, research output must find quick and efficient ways to be transferred to the community. 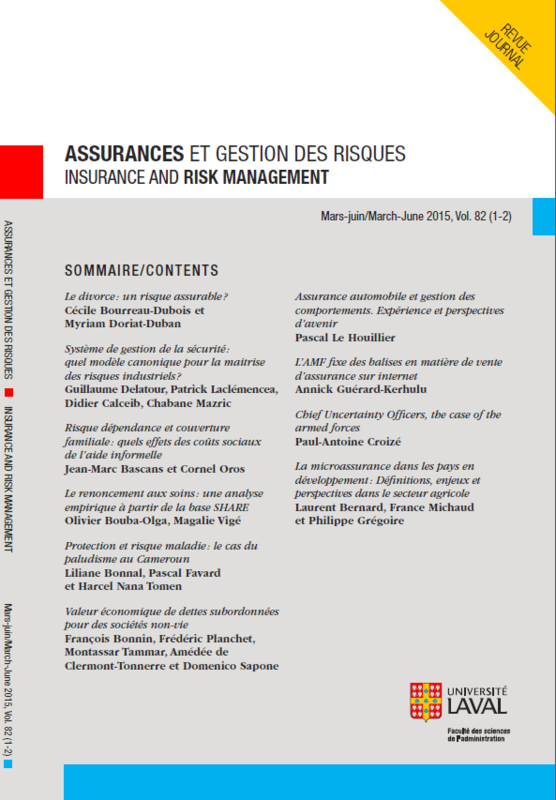 The journal Assurances et Gestion des Risques presents a unique platform to publish academic and professional articles, and this in French and in English.